தற்போது இலங்கையில் நடைபெற்றுக் கொண்டிருக்கும் கிரிக்கெட் சுற்றுப் போட்டியில் ஏதாவது ஒரு நாடு வெற்றி பெறலாம், ஆனால் வெற்றியின் பின்னர் நமது நாட்டின் ஜக்கியத்திற்கும் இறைமைக்கும் பாதிப்பு ஏற்படாத வகையில் சகலரும் நடந்து கொள்ளவேண்டுமென அகில இலங்கை ஜம்இய்யத்துல் உலமா அன்பாக வேண்டிக் கொள்கின்றது. We are deeply disturbed and outraged by reports of the destruction of a place of Buddhist worship in Bangladesh. We are saddened that this despicable act is said to have been committed by a group of misguided Muslims. We unreservedly condemn this reprehensible act and call upon the Government of Bangladesh to take immediate action in this regard. Such acts of religious bigotry and intolerance are completely prohibited by the tenets of Islam which is a peaceful and viable way of life. The Holy Quran expressly states that there is no compulsion in religion and exhorts all Muslims to engage with persons of other faiths with reason and kindness. The Holy Prophet of Islam (on whom be peace) was the very epitome of compassion and tolerance. Islamic history is replete with instances embodying such tolerance. If one may give a random pick – the Holy Prophet was persecuted and assaulted when he preached his message in the city of Taif. Attacks and sinister criticism against Islam and Muslims have dramatically increased in the last few decades. Since Salman Rushdie published his book satanic verses we have seen many provocative activities against Muslims throughout the world and particularly in European countries. Sometimes, some anti-Muslim elements openly come out and attack Islamic places, mosques, and physically attack Muslim brothers and sisters. Many incidents of such attacks have been have been reported in many parts of European countries and these provocative acts are expressed through books, news papers, magazines, cartoons and films to gauge emotional pulses of Muslim people throughout the world. Time to time provocative actions are taken by anti-Islamic forces to create communal tension between Muslim and Non-Muslim communities in Europe and more importantly to portray Muslims as violent and extremist people. Riyazdeen Shahjahan bags the award for contribution to media. The Ten Outstanding Young Persons or the TOYP award recipients for 2012 organised the junior Chamber International were announced on Monday evening. The Ten Outstanding Young Persons is one of the most prestigious international award seletion and has been held in Sri Lanka for the past thirty three years. International luminaries who have won this award in the past include former US President’s, John F. Kennedy, Bill Clinton and Henry Kissinger. The winners of the award this year are in the category of business, economic and entrepreneurial accomplishment, Thushantha Jayasundara. The award for academic leadership was won by Dr. Faiz Marikkar. In the name of God the most Merciful and Compassionate. Peace be upon Prophet Muhammad, upon all the Prophets and Messengers of God, and upon his companions Abu Bakr, Umar, Uthman and Ali. I declare open the XVI Summit of the Non-Aligned Movement. The Movement that succeeded to turn the vision of its founding fathers from principles and concepts to concrete actions, from a condition of weakness to a source of strength at the international stage. The threat of war against Syria and Iran has been grabbing headlines for weeks, accompanied by ever more sensationalist claims by the mainstream media. The tensions are naturally high and the scenario could be grim. Michel Chossudovsky, a Canadian professor of economics and author of several books charges that “a sophisticated and all encompassing propaganda programme supports war in the name of world peace and global security. The underlying scenario of worldwide conflict goes far beyond the diabolical design of [George] Orwell’s 1984. The Ministry of Truth upholds war as a peacemaking undertaking by twisting realities upside down. In turn, the lies and fabrications of the mainstream media are presented with various innuendos in a complex web of deceit”. More than one billion Muslim people are fasting this month from dawn to dusk all over the globe. This is indeed a blessed month and Muslim people are happy to welcome this holy month. Muslim devotees are dedicating their time and energies in devotion, supplication and religious rituals during this holy month. More times are spent in the mosques, more people are reading the holy Quran, and more charities are exchanged between people. Fasting is one of five pillars of Islam. It is beyond the scope of this article to cover all aspects of this pillar and yet I will try my best to give some basic points about fasting and most of time our Non-Muslim brothers ask. Why do Muslim fast and how do they starve from dawn to dusk and how do they go without water or drinks whole day and now it is nearly 17 hours in western countries. Some people see it as a daunting task. But believe me it is not a difficult task and even 8 years old children could do it. Fasting in the month of Ramadan is one of beautiful aspects of Islam that unites all Muslims all over the world and gives practical dimensions to the universal brotherhood of Muslim people. The month of fasting is a place of exile from illusion and fashion and a pilgrimage deep into one’s self. The month of Ramadan is at hand and with it, Muslims will be entering into one of the finest and most beautiful schools of life. The fasting month is a school of faith, spirituality, awareness, giving, solidarity, justice, dignity and unity. Nothing less. It is the month when introspection among Muslims should be deepest; the month of their greatest contribution to humanity. The month of Ramadan is the world’s most widespread fast and yet its teachings are minimised, neglected and even betrayed (through literal application of rules that overlooks their ultimate objective). As the dawn of Ramadhaan approaches, offering us glimpse of its golden rays of purity, every Muslim around the world prepares to experience the warm ambience which only this month can bring. From Suhoor to Iftaar to Taraaweeh Salaah, Ramadhaan brings together brothers, sisters, parents and children. In order to derive the utmost benefit from the sacred month of Ramadhaan, it is crucial to recognize the spiritual significance and importance of this month. Fasting during this month should be only for ALLAH TA'ALA, and that HE will give the reward for it, for the reward of ALLAH, the Bountiful and Munificent, is greater and vaster than anyone could imagine, Subhaan-ALLAH! I have given here a precise summary of IERA’s research findings concerning perceptions of Islam, Muslims and how Islam is presented to Non-Muslim in England. Though this a sample survey with very limited numbers of respondents it tells lots about Non-Muslim perceptions of Islam and Muslim in general. This survey is carried out by Non-Muslim Company on behalf this Islamic education and Research Academy. Finding of this survey were released on 23/07/2010 at London Muslim Centre. This research finding is an eye opener not only Muslim minority in UK but also for the entire Muslim people all over the world particularly for Muslim minorities. These findings should encourage Muslims people to review and re-evaluate their attitudes and methodologies in reaching out to Non-Muslim people. The Sri Lankan Embassy has rejected reports in Colombo claiming yesterday a Sri Lankan domestic worker has been arrested in Saudi Arabia for worshipping a statue of the Buddha. According to the Bodu Bala Senaa, a Buddhist organization based in Colombo, it was alleged the youth, identified as Premanath Pereralage Thungasiri, was arrested by Ummul Hamam police for worshiping the statue inside his home. It was alleged in the report Saudi authorities were planning to execute him. Muslim Brotherhood candidate and president-elect in victory speech vows to unite the country and stand up for democracy. The Muslim Brotherhood's Mohamed Morsi has officially won Egypt's presidential election and will be the country's next president, the electoral commission has announced. Morsi picked up 13.2 million votes out of just over 26 million, giving him about 51 per cent of the vote. His competitor, Ahmed Shafik, the final prime minister under Hosni Mubarak, received 12.3 million. More than 800,000 ballots were invalidated. The president-elected delivered a victory address on Sunday night. He spoke on state television, long a medium which demonised him and the Muslim Brotherhood. He thanked the Egyptian people for their votes, calling them "my family" and "my beloved," and promised to work to "restore their rights." "I have no rights, only responsibilities," Morsi said. "If I do not deliver, do not obey me." 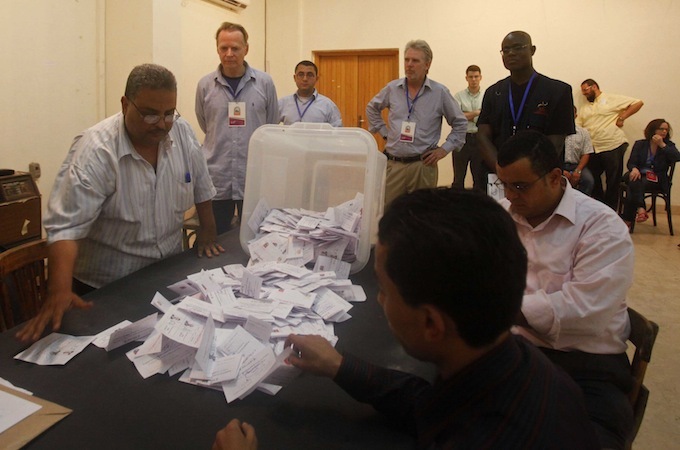 Brotherhood claims victory based on unofficial tallies, but SCAF decree limiting presidential powers overshadows count. The Muslim Brotherhood has declared their candidate, Mohammed Morsi, the winner of Egypt's presidential runoff, and unofficial vote tallies show him leading the race by more than one million votes. The group held a press conference early on Monday morning to announce Morsi's victory. With 12,793 of the country's roughly 13,000 polling stations reporting, Morsi had 12.7 million votes, while his opponent, Ahmed Shafiq, had 11.84 million, the group said. His staff and supporters broke into chants of "down with military rule" after the results were announced. Morsi himself also spoke. He addressed the families of the martyrs killed during the revolution, and promised to restore their rights in a "state of laws". Egypt is no ordinary place. It is the land where tyranny runs deep and Pharaohs claim to be God. And yet, paradoxically, Egypt also is the place from where the clarion cry of freedom rang out when Moses (May God Bless Him!) demanded from Pharaoh: Let My People Go! Or, as the Qur’ān put it: Arsil ma’iya banee Israa-eel. After thousands of years, that same timeless drama of Right vs. Wrong is being played out again. And this time, it is between a modern-day Moses in the person of Ikhwan’s candidate for President, Dr. Muhammad Morsi, and the forces of tyranny and corruption embodied in the Military regime of Mubarak and others. What does the Egyptian election portend? Reply to Dr Ameer Ali’s biased criticism of Islamism in Srilanka.